Columbia's strain sensors take the work out of strain sensing. They are complete and thermally compensated strain sensing solutions. Columbia's strain sensors are much easier to install compared to foil strain gages by themselves and provide additional accuracy given the thermal compensation. Columbia's strain sensors have been flight qualified, including requirements to FAA DO-160, and have been used on military and commercial aircraft for more than 30 years. 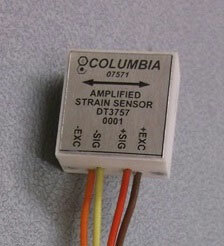 Columbia's strain sensors have been used on various aircraft including large cargo airplanes, fighter aircraft, and helicopters. The DT3757 series takes Columbia's strain sensors to the next level by integrating an amplified within the sensor body providing a higher signal to noise ratio. Columbia's DT3757 has a signal 10 times higher than standard strain gages. In addition, the DT3757 series is interchangeable with Columbia's DT2684 series. The simplicity of use and reliability make them ideal for other applications including structural monitoring, geophysical measurements, and laboratory use. Exports from the United States are subject to the licensing requirements ofthe Export Administration Regulations (EAR) and/or the International Traffic in Arms Regulations (ITAR).